Japanese nationals residing in London, in common with members of the wider Japanese community in the United Kingdom, include business professionals and their dependents on limited term employment visas, trainees, young people participating in the UK government sponsored Youth Mobility Scheme, students, as well as Japanese emigrants and their descendants who have settled in the city. In terms of cultural assimilation there is a wide spectrum of experience: from Japanese immigrants who have made London their permanent home to company employees and their families transferred on short-term assignments whose social networks are often limited beyond the Japanese expatriate community. In 2001 over half of people born in Japan who lived in Britain had their homes in Greater London. Japanese people have been visiting and living in London since the early 1860s: the First Japanese Embassy to Europe arrived in 1862 and the Chōshū Five, students from the Chōshū domain who studied at University College London, arrived in 1863. In June 1879 Mitsui & Co. established its London office and by 1884 there were 264 Japanese residents registered in Britain. Shipping and trade links between the two countries grew in the wake of the Anglo-Japanese Alliance signed in 1902 and Britain's Japanese population reached a prewar peak in 1935 of 1,871. In the 1970s and 1980s the Japanese population resident in the United Kingdom grew rapidly reflecting the growing strength of the Japanese economy and the decision of many Japanese firms to set up their first European manufacturing and operational hubs in the country. The majority of Japanese corporate offices were located in London and the South East of England and Japanese grade schools and social facilities developed to support this community. In 1994 54,415 Japanese nationals were registered as living in the United Kingdom, 38,000 of which were concentrated in the Greater London area. Residential centers of the Japanese community in London have traditionally included areas such Acton, Finchley and Croydon, proximate to Japanese language based grade school and weekend language programs provided in these areas. Based on fieldwork conducted in the early 1990s, Junko Sakai (酒井 順子 Sakai Junko) observed that at the time there was no particular location for the Japanese community in London, but that the families of Japanese "company men" had a tendency of living in North London and West London. In 1991, according to The Economist, lower-ranked Japanese workers tended to live in Croydon. The newspaper stated that Japanese middle managers had a tendency to live in Ealing, Finchley, and Golders Green. The Economist added that bosses of the Japanese offices lived in Hampstead and St John's Wood. Concentrations of Japanese residents support a greater density of Japanese restaurants and shops. The City of London hosts many Japanese insurance companies, banks, and security houses, and along with the Japanese businesses the City of London includes Japanese job agencies, interpretation and translation companies, and restaurants. Sakai states that the City of London is "perhaps" the "most important centre" of the London Japanese community. Japanese owned stores and businesses have been operating in London since the late 19th century. Yamanaka & Co., a prominent Asian art dealership founded by Sadajirō Yamanaka opened premises in New Bond Street in 1900 and was granted a Royal Warrant by George V in 1912. In 1913 Mikimoto opened its first cultured pearl boutique outside Japan. In 1993 when the expansion of the Japanese business community in London was at its height, Yaohan Plaza in northwest London was opened as a Japanese community targeted shopping centre. The mall was subsequently sold in 1999 to a Malaysian company changing its name to Oriental City, and offering pan-East Asian food retail and a restaurant foodcourt. The centre was finally closed in June 2008. In the 1990s Sogo also operated an outlet close to Piccadilly Circus mainly catering to Japanese package tour groups. In the early 1990s according to the Economist magazine, London had eight Japanese food shops and over 60 Japanese restaurants. For much of the late 20th century retail establishments dedicated to serving the specific needs of the Japanese community in London remained relatively few in number reflecting both the smaller size of the overall Japanese population in the United Kingdom as well as the growing availability of Japanese retail products from established British retail outlets. The changing tastes and demographics of the Japanese community in London and the growing embrace of Japanese food and culture in the United Kingdom has significantly altered the availability of Japanese fashion, homewares, specialist food products and restaurants in London. Large stores such Muji and Uniqlo have been long established in the UK; smaller independents such as tokyobike and CA4LA are also to be found. Supermarkets such as Waitrose and online shopping services now provide a wide range of Japanese specialist food and beverage products. The Piccadilly Circus area continues to support a number of smaller Japanese bookstores, food shops, restaurants, and travel service offices, the longest established being the Japan Centre first opened in 1978. Japanese retail food offerings in London, offering varying degrees of authenticity, include popular chains such as YO! Sushi and Wagamama as well as smaller independent restaurants such as Kanadya and Kirazu. Japanese children in London attend a variety of schools including the Japanese School in London, Independent, and local state funded schools. The Japanese School and three Japanese government sponsored Saturday language programs in the Greater London area serve as geographical hubs for Japanese families with school age children. The Japanese School first opened as a supplementary school in 1965. 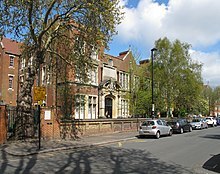 Prior to the school's relocation to Acton in 1987, it was located in Camden, in a building now occupied by North Bridge House School. The Japanese Saturday School in London (ロンドン補習授業校, Rondon Hoshū Jugyō Kō), a Japanese supplementary school, is a part of the institution. In 2003 several state primary schools developed support programmes for Japanese children. For example, West Acton Primary School has a parent-teacher association for Japanese parents. Some Japanese students in London attending secondary school go to other international schools, including The American School in London. In 2003 Paul White, author of "The Japanese in London: From transience to settlement? ", wrote that "even company movers do not necessarily put their children through the Japanese schooling system in London". Sakai noted in her book that some Japanese families sent their children to British boarding schools and, in the case of university students, to "Oxbridge" (University of Oxford and University of Cambridge), in order to, as stated by Sakai, "give their children the 'best' education in Britain." Japanese corporate welfare systems in the early 1990s provided employees with rental accommodation options described as "comfortable", and Japanese company men and their families enjoyed "luxurious lives compared to Japanese settlers". Companies in the 1990s sometimes paid generous subsidies to employees sent abroad to provide housing, so there is a perception that their lives are more comfortable in London than back home. The Japanese Embassy is located on Piccadilly in central London. Organizations supporting Japanese nationals living and working in London include the Nippon Club, the Japan Society and the Japanese Chamber of Commerce and Industry. Sakai, Junko. Japanese Bankers in the City of London: Language, Culture and Identity in the Japanese Diaspora (Routledge Studies in Memory and Narrative). Routledge, October 12, 2012. ISBN 1134645082, 9781134645084. White, Paul. "The Japanese in London: From transience to settlement?" In: Goodman, Roger, Ceri Peach, Ayumi Takenaka, and Paul White (editors). Global Japan: The Experience of Japan's New Immigrant and Overseas Communities. Routledge, June 27, 2005. ISBN 1134431457, 9781134431458. ^ "Born Abroad: An Immigration map of Britain". BBC News Online. Retrieved 17 June 2017. ^ Conte-Helm, Marie (2012). 'The Japanese and Europe. London: Bloomsbury. p. 67. ISBN 9781780939780. ^ Conte-Helm, Marie (2012). The Japanese and Europe. London: Bloomsbury. p. 68. ISBN 9781780939780. ^ a b c d e Sakai, Page unstated (PT67). "Although the Japanese have no precise geographical location for their community, they are connected with each other personally, and one of their geographical centres is the Japanese school in London, previously in North London and now in West Acton." ^ a b "Britain: Japanese Spoken Here." The Economist. 14 September 1991. Volume 320, Issue 7724, p. 67. ISSN 0013-0613. CODEN ECSTA3. Accession number 00541106, 00898348. Available on ProQuest, Document ID 224204538. "Once here, they look for a location that reflects their position in the social pecking-order: Around London it is St John's Wood and Hampstead for bosses; Finchley, Golders Green and Ealing for middle managers; Croydon for lower ranks." and "London has more than 60 Japanese restaurants and eight Japanese food shops to stave off the torments of English food." ^ "Mikimoto History". Mikimoto. Retrieved 20 June 2017. ^ a b c d e White, p. 89. ^ "Six People Bringing the Japanese Retail Experience to London". Something Curated. Retrieved 20 June 2017. ^ "London's Best Japanese Restaurants". Time Out London. Retrieved 20 June 2017. ^ "Which School?" Truman & Knightley Educational Trust, 1989. p. D-66 (See search page). "THE JAPANESE SCHOOL I Gloucester Avenue, London, NWI Tel (01) 485 0700 Head H Fujino Type Co-educational Day 9-14 No of pupils 536 Fees On application NORTH BRIDGE HOUSE JUNIOR SCHOOL I Gloucester Avenue, London,"
^ "Japanese PTA (日本人PTA)." West Acton Primary School. Retrieved on 6 July 2017. Pernille Rudlin, The History of the Mitsubishi Corporation in London: 1915 to Present Day. Routledge, London, 2000. Wikimedia Commons has media related to Japanese community of London. This page was last edited on 1 December 2018, at 03:58 (UTC).